Billion Dollar Gran is based around the comical theme of Granny Florence who happens to be super rich! 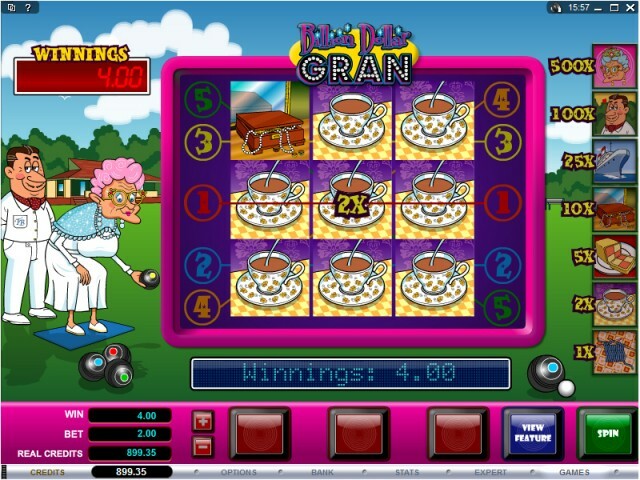 The game is a 3-reel, single payline fruit machine that features good old Granny Florence knitting to the side of the reels as the symbols, including Tea Cups and Battenberg Cake, spin and hopefully land in a winning combination. During regular play winning combinations do not earn you hard cash but with Win Spins. When you hit a winning combination – something made easier with the options of nudges and holds – a new window will open where players are presented with a 3-reel, 5-win line machine. Here you will use your Win Spins to hit combinations that will multiply your original stake from anything between 1x and 500x. There is also an interesting and somewhat comical 3D video bonus feature in the game that is triggered when three Bowls symbols appear in the regular gameplay. Here you get to join Granny Florence in a game of bowls by picking one of the coloured bowls at the start of the game. You then get to watch the Billion Dollar Gran roll each bowl towards the jack. If the coloured bowl you selected ends up being closest to the jack you could win a multiplier of up to x2000! These sort of bonus features are similar to those you would find on other classic fruit machines such as Deal or No Deal and Rainbow Riches. It’s quite a bizarre but nevertheless entertaining theme and is great fun to play the Billion Dollar Gran fruit machine. You can experience the fun for free or play for real at Ladbrokes or 32 Red casino – both casinos come highly reccommended!